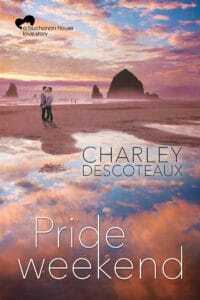 Happy Release Day to Charley Descoteaux! If you’re eagerly awaiting the release of Tiny House, Book #3 of the Buchanan House series, then here’s something to tide you over… a free Buchanan House story to bridge the gap. It’s Pride Weekend in Lincoln City and Adam and Silas pool resources to share a room at the Buchanan House. Just roommates, right?